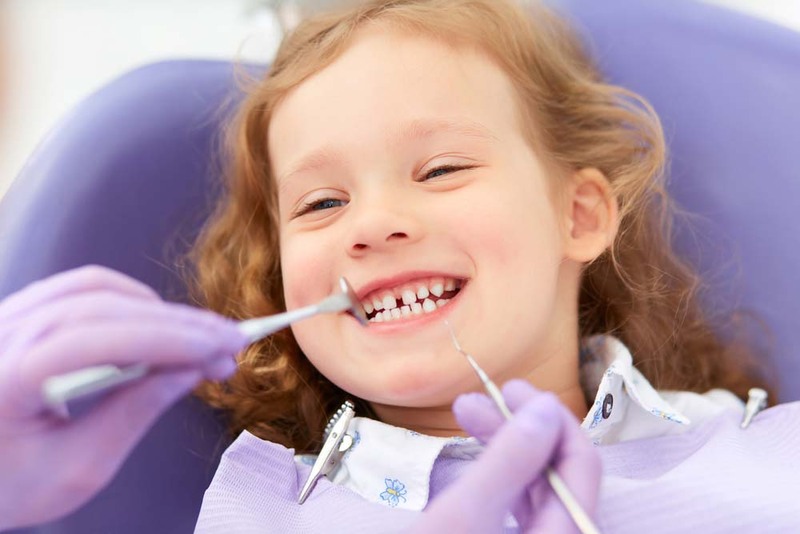 Most often small or moderate-sized cavities on baby teeth are treated with fillings. However, if a baby tooth has a large cavity that is adjacent to or within the “nerve” or “pulp” of the tooth, then a pulpotomy will be needed. A pulpotomy is a procedure that removes the cavity and the top portion of the pulp. (The pulp is where the nerve and the blood supply of the tooth are located.) The tooth is then filled. Because this filling is very large, the tooth is at risk for breaking. So after the pulpotomy is completed, a prefabricated crown will be fitted to the baby tooth and cemented into place. This is all completed in one visit. A local anesthetic and nitrous oxide are used during the procedure to numb the area and alleviate any anxiety or fear. At Page Dental Arts, we do not use the traditional stainless steel prefabricated crowns; we use crowns that have a white outer layer. These crowns not only restore the tooth but also provide a more pleasing aesthetic result than the traditional stainless steel. Pulpotomies and prefabricated crowns are a great way to restore an affected baby tooth and retain it until the adult tooth comes in. After this procedure, periodic checkups are required every six months to ensure the health of the treated teeth.